A glittering gift for someone special. These glamorous 9ct gold crystal set earrings are sure to add a little sparkle to the occasion. 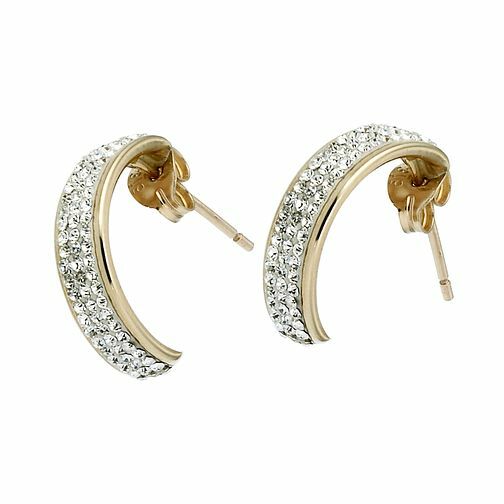 9ct Gold Rimmed Crystal Half Hoop Stud Earrings is rated 4.8 out of 5 by 4. Rated 5 out of 5 by Anonymous from Lovely sparkle Well made and look fantastic. Just the right size don’t look gaudy. Rated 4 out of 5 by Anonymous from Quite light These earrings are a lot lighter than I thought they would be but they are a good size and look very elegant without looking flashy and ott. They are very comfortable to wear.